Building 2 cars for Jeffs race. Both have DR-1 chassis. Bodies are mounted but need paint etc. Both ran respectable out of the box hitting .7s @ 17-18 MPH. 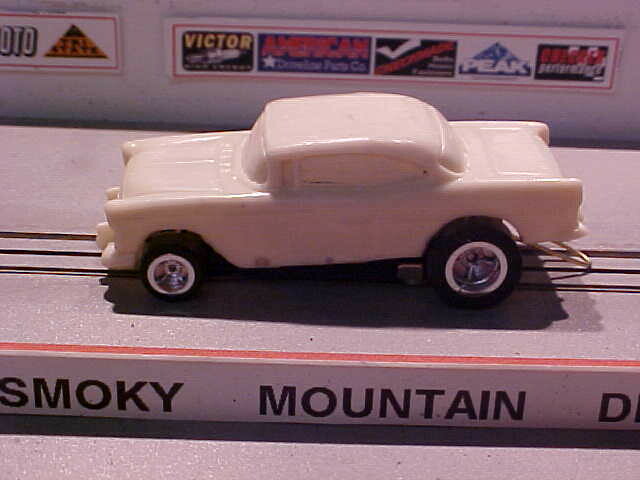 57 Ford, I don't think I have ever seen one at any HO race. 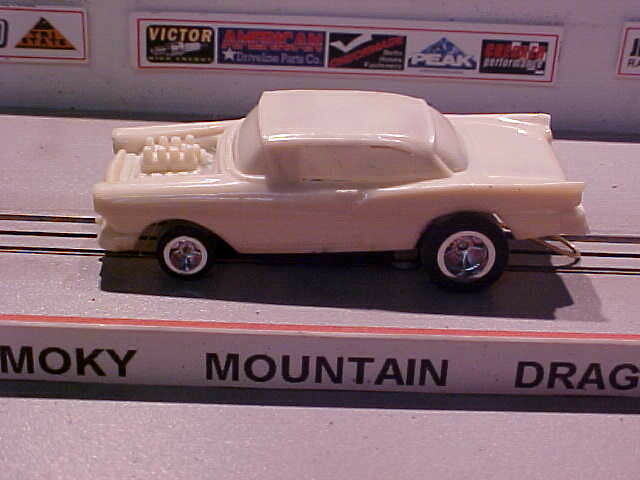 55 Chevy, I have seen many of them at many races. I made a small change to the rules for Inline Stock. 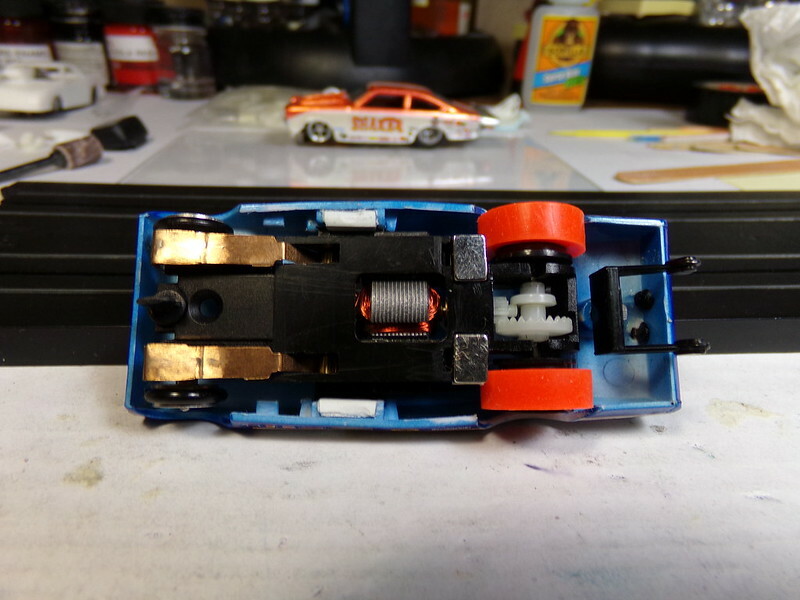 I will allow cutting of the DR-1 chassis in the traction magnet area only. Allowing the magnets to be lowered. They are pretty much useless in their stock form. 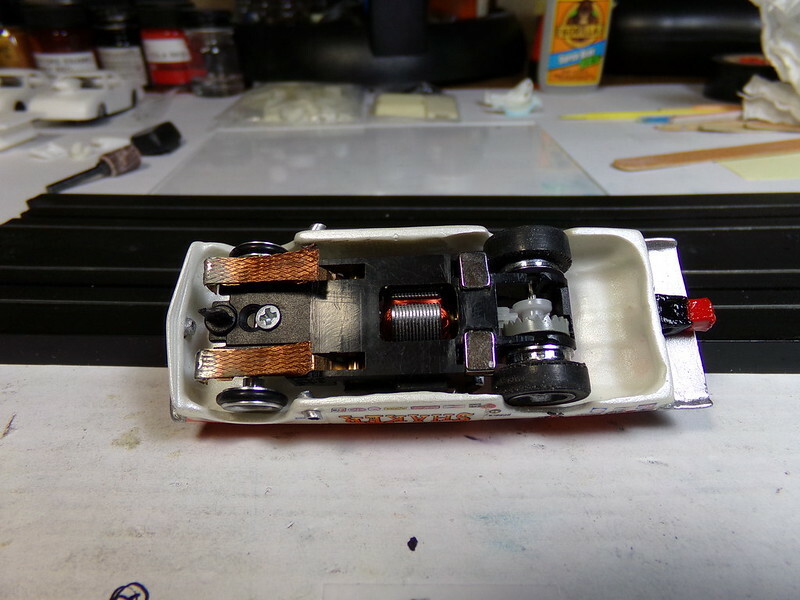 The chassis can be cut easily to allow magnets to be lowered and glued into place. These are my two DR-1 builds. I removed the plastic underneath the magnet and glued them where I needed. It is easily cut with a razor....very thin plastic. Just removing the plastic and not moving them magnet makes a huge difference in the downforce. The magnets are more than strong enough to do the job. Without this modification, I don't believe it would be competitive against the SG+ or others. Both are very cool rides. I like the 57 Ford myself. Looking good so far! I can hardly wait to see them fly down the strip. Ok..I'm curious. I been out of this for quite a while..but what does "musclecar type street body" mean? My interpretation of that would be no 'extended' spoilers (anything more than a short deck mounted, 'factory' type spoiler), and no "pro stock" style hood scoops (factory appearing scoops)or blowers. But..I apparently am wrong, which is GOOD..lol. Since the one car I have is definitely not what I described as my interpretation of the rules, and apparently a few others have that idea too. I'll try to get pics so you can see it. Drag Racing...Because if you can turn, you're not going fast enough! This is a necessary modification to this chassis as they mounted the stock magnet to far above the rails to be effective. I was going to remove the stock magnets and put two big magnets under the chassis. Stock magnets are strong reading around 2500 gauss, they are just to far above the track. I will allow the addition of two external magnets on the DR-1 only. As long as the stock magnets are removed.....for anyone using that chassis. I know not everybody likes cutting on their chassis. Ron that is actually a pretty GOOD interpretation of the rules. I won't be too picky for those that have a limited supply of bodies, but I would prefer a more stock appearance without any big scoops or wings. Something that would typically be seen on the street. I don't want somebody not entering the race because they don't have a body though. That's a clever build you did on the Altered! Thanks i was thinking of calling it fly swatter .hoping to get some paint and a grill done before race ,still trying to make it competitive and that's no small task racing with you guys figured when i heard polymer mag first thought was #30,30 raps,on the 3 lam and call it the trifecta instead put a 6ohm in it .this is a good build to reinforce the ceramic v poly comparison test that Dave posted. My list car is still faster on 20v with dash mags ,oh ya bolth the list cars got a little attention as well. 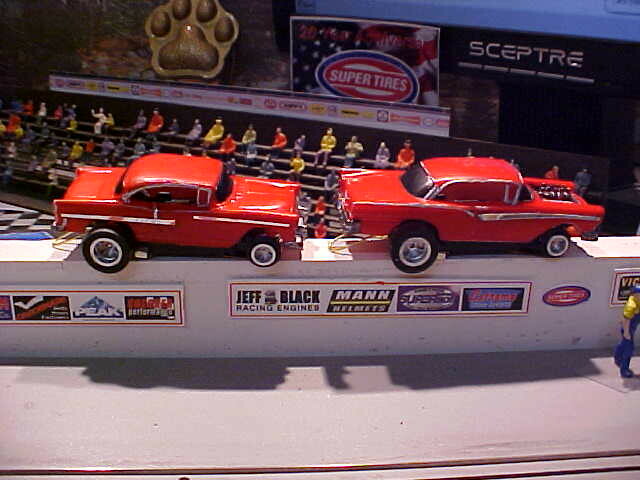 Finished off the bodies on the 57 Ford and 55 Chevy with some chrome tape. Don't know how well it will stay on. Got some impressive numbers out of the cars for inline stockers. Dave, is that Ford, Chevy powered??? I think it is a Chevy motor disguised as a Ford!!!! Hi Jeff, I will be up for this in the Rookie class. 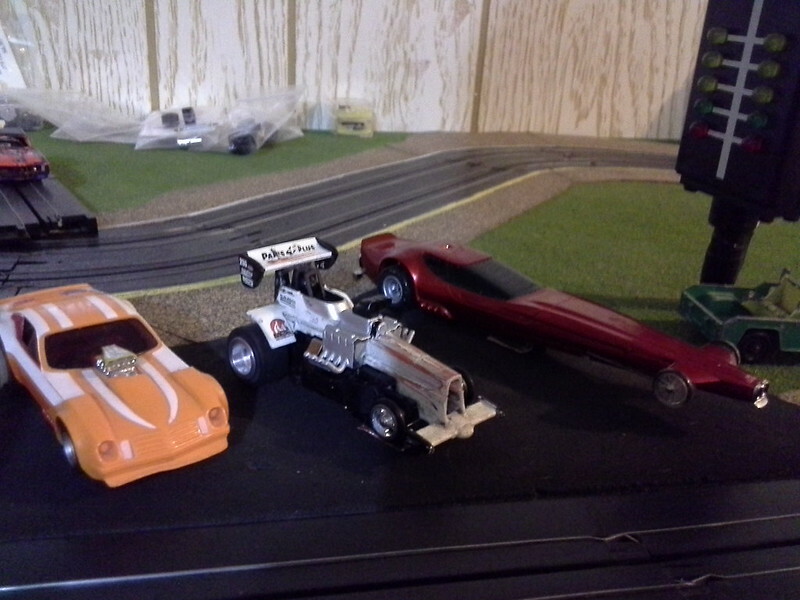 I have some DR1 chassis on order but it depends whether they get here in time to build them. I will have a go anyway. I missed out on the New Zealand race due to a health problem but I am fine now. Do you have a date for the cars to arrive,as my cars will have to cross the pond?